Bracelets? Watches? These ingenious examples of the jeweller’s art embrace both: haute joaillerie and haute horlogerie at their best. For the decoration of this secret watch, the craftsmen in the Chopard studios were inspired by motifs from Inca art. Like a Pre-Columbian mosaic, turquoises and brilliant-cut diamonds form the decoration on the cover plate that transforms this watch into a beautiful bracelet. The pattern is repeated on the white, mother-of-pearl dial in the middle of the classic design that is so characteristic of the Imperial collection, of which this watch forms a part. 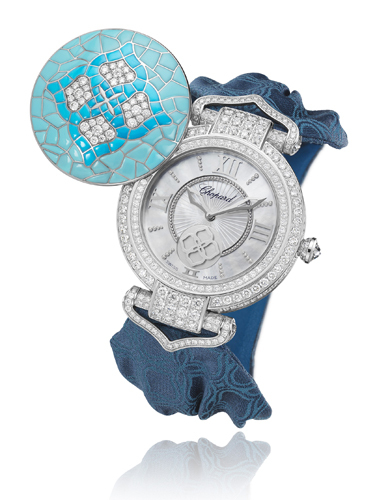 The 38 mm case with a damask strap is of Fairmined white gold set with diamonds and houses Chopard’s automatic L.U.C. 96 12-L movement. The shape of a sequin was what inspired Van Cleef & Arpels when creating the Bouton d’Or watch. The sheen of the round, yellow-gold links integrates harmoniously with the sparkle of the brilliant-cut diamonds in various formats. The play of the round forms – a design that was already being used by Van Cleef & Arpels in the 1940s and 50s for bracelets and necklaces – is carried through to the dial of the 20 mm case in which a quartz movement is placed. 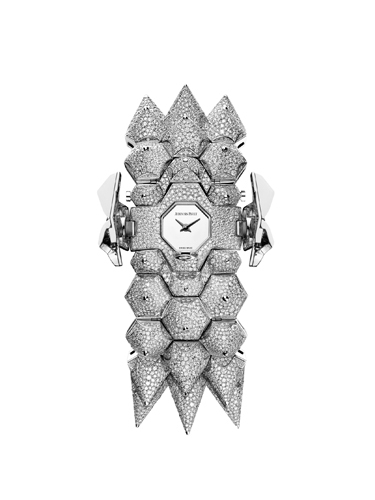 Diamond Outrage is the name of this bracelet watch – which is no exaggeration! 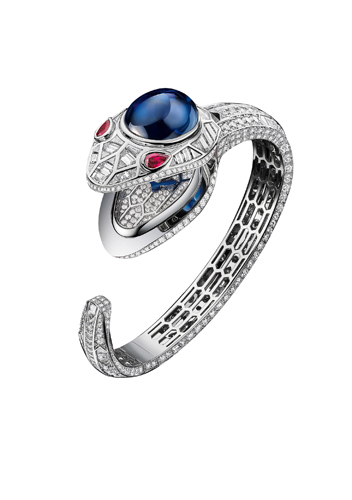 This example of phenomenal haute joaillerie is a one-of-a-kind piece. Saying that it makes a statement is quite an understatement. The explosive look was created with a snow setting of 9,923 brilliant-cut diamonds that almost completely hide from view the underlying white gold. Three of the spikes are particularly eye-catching due to the 354 baguette-cut diamonds in an invisible setting with which they are decorated. The Diamond Outrage has a quartz movement. The most well-known version of the Serpenti is the one with the expanding tubogas strap. This Serpenti Seduttori is slightly less flexible due to its solid white-gold strap decorated with brilliant and baguette-cut diamonds. The snake – an ancient Greek-Roman mythical symbol for wisdom, vitality and temptation – has a cabochon-cut sapphire on its head, while two pear-cut rubies form the eyes. In its open mouth the white-gold dial of the watch is visible, which is powered by a Calibre B033 quartz movement. 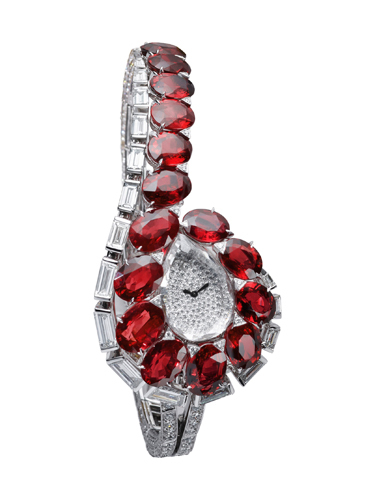 This Divine Time by Harry Winston is a watch and a pendant in one. The blue crocodile-leather strap can be exchanged for a white-gold necklace, set with a brilliant-cut diamond. The white-gold case of 25 x 26 mm and the white-gold dial are decorated with a total of 244 brilliant-cut diamonds, 2 baguette-cut diamonds, and 10 marquise-cut diamonds. The Divine Time runs on an HW1051 quartz movement. Fifteen Mozambican rubies give this Trait d’Éclat its intense, red glow. With this white-gold jewel watch, Cartier combines two favourite elements that are repeatedly to be found in its collections: rubies and ribbon motifs. In the past, rubies decorated jewellery that the house made for maharajas and celebrities such as Grace Kelly and Elizabeth Taylor. In the Trait d’Éclat the rubies are accompanied by baguette and brilliant-cut diamonds and a mechanical Cartier calibre 101 movement.